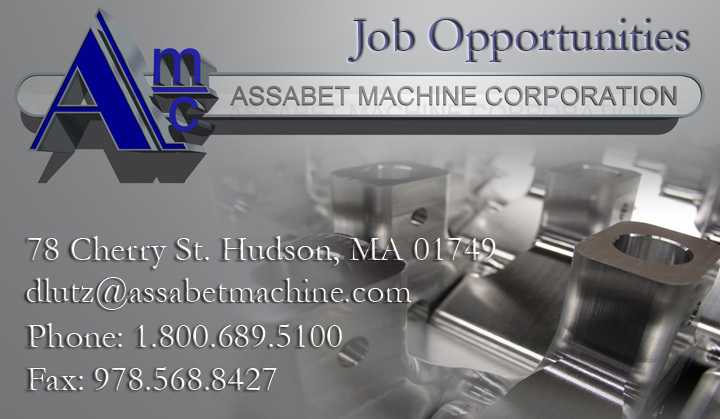 Assabet Machine Corporation has immediate opening for experienced Class A all-around machinist. Applicant should possess a strong lathe background (both CNC and manual) and be familiar with manufacturing a wide range of geometries from various materials. We offer competitive wages and excellent benefits including: health, dental, life, STD and LTD insurances; a 401K profit sharing plan with a 25% company match and vacation, sick time and holidays. Apply by mail to P.O. Box 467, Hudson, MA 01749; by fax to (978) 568-8427 or by email to dlutz@assabetmachine.com.